If ever there was an example of the power of simplicity, it’s been the rise of what we call floating-granite-ball fountains. They’ve been around since the early 1990s and are now found in a range of commercial and even residential settings. As has been the case every time a prospect has asked about one of these fountains since then, school administrators wanted something interesting, interactive and sculptural, and the floating ball seemed the natural choice. We’ve seen these engaging watershapes grow steadily in popularity through the years, so much so that they’ve effectively passed beyond “fad” status to become an accepted part of our repertoire. In fact, when we added them to our web site just a few years ago, inquiries about the spheres really started to flow – and they’ve continued to grow in numbers to this day. 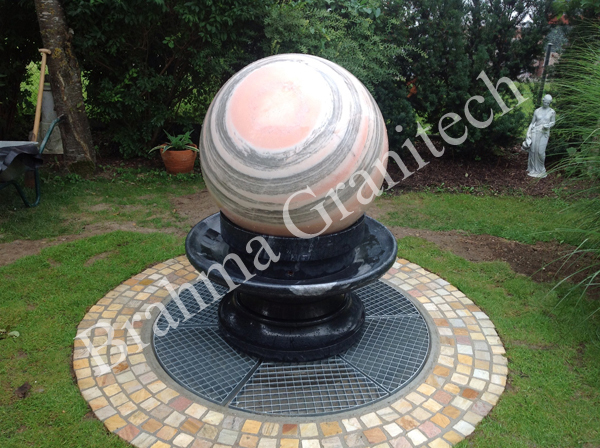 In concept, floating-granite-ball fountains are extremely simple: They include a large granite ball measuring anywhere from two to nine feet in diameter and a matching concave socket that envelops about 30 percent of the sphere’s surface. When water flows into the socket, it is pressed to an infinitesimally thin sheet by the weight of the ball. Nonetheless, that small quantity of water causes the ball to hydroplane and enables it to rotate. Achieving this dynamic effect obviously depends on having a perfectly machined tandem of sphere and socket. Any irregularity anywhere will stop the ball from floating and spinning. Once sphere and socket are matched, the socket is core drilled in one or two places (depending upon the desired effect) to accommodate a low-pressure flow of water – typically between 12 and 20 pounds per square inch, which is about what you get from a garden hose. 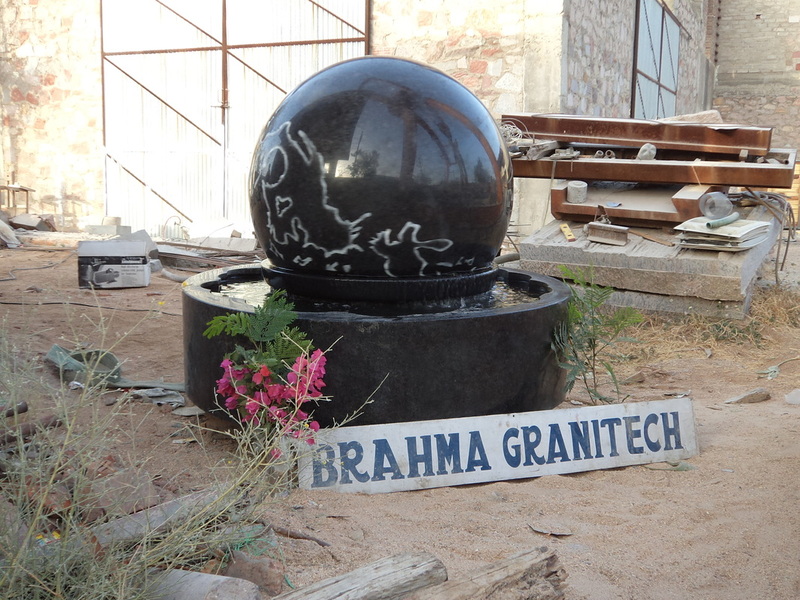 The shiny, wet surfaces of the heavy granite balls are visually striking no matter where they are placed. As a result, we’ve provided these fountains for a wide range of clients and settings, including hospitals, casinos, universities, public spaces, business parks and high-end residences. The granite balls come in a wide range of colors and sizes, but it may be said that the real distinctiveness of each design comes from the structures that support the sockets. These housings range from the simple to the elaborate – and from those that make the moving balls completely accessible to those that make them more purely sculptural (and less interactive). As pretty and visually versatile as these objects may be, it’s the interactive nature of these fountains that really give them their greatest appeal. When anyone looks at a ball of granite that may be up to eight feet across, they know it’s heavy. The fact that they can walk up to it and move it freely with just their fingertips is a constant source of amazement. Kids love these fountains, but it’s my sense that they’re even more intriguing to adults who have a fuller understanding of just how heavy the ball is and how improbable is its ability to move so freely on a paper-thin sheet of water. Stepping beyond that immediate attraction is a more enigmatic source of the appeal: Spherical forms are universal icons in geometry, science, geometry and even religion. With a form that is symbolic and organic as well as architectural, these fountains work when set amid natural forms of plant and stone as well as within the rigid geometries of modern architecture. And then there’s the fun factor: These fountains are beautiful works of art that basically function as huge toys. Paralleling this emergence of these fountains has been a resurgence of interest in granite as a building material. This has had the benefit of inclining suppliers to seek out and harvest stone in a huge range of colors and visual textures. The floating balls and sockets must be made of granite because it is less porous than other stones and much harder than most. Also, granite can be found in large enough pieces to create the balls, whereas other hard materials are often not so commonly quarried in solid pieces that can be machined into large spheres. While these watershapes tend to become the center of attention in most placements, the floating granite balls also can be used as shapely accents in broader landscapes – and as rewards to the curious who take a few extra steps to see what’s going on. Because the perfection of the sphere is so critical, preventing wear is an important issue. If the spheres were to be made of marble or quartz, for example, they would be exponentially more expensive while being quite susceptible to damage from exposure, for instance, to acid rain. With granite, by contrast, both spheres and sockets maintain their critical smooth finish and perfect spherical shape indefinitely. Worldwide, there are only a small handful of companies that create the granite balls and sockets used in the fountains described in the accompanying text – and all of them are overseas. As a result, before they’re shipped the balls are all balanced using a lead inserts – a process very similar to balancing an automobile tire. As it turns out, this gold-colored granite was much less durable than other forms. Although we were able to seal this ball and put it back in service, we learned a quick lesson in the fact that not all granites are created equal. That one project aside, however, the granites we’ve used have held up without the need to apply surface sealers of any sort. We’ve also found ways to make each project distinct. Where the spherical form of the ball is an essential standard element of these fountains, there’s an opportunity for considerable variation in the treatment of the socket. In some situations, for example, we’ve obscured the socket in fieldstone frames. In others, the socket’s exterior faces have been sculpted into various shapes. The way the water flows out of the socket is also subject to variation. In some designs, for instance, the water flows into a channel right around the perimeter of the socket, while in others the water trickles over the edges of the socket and can be directed to shape a variety of subtle effects. Our role in providing these fountains typically involves working with the client to develop the design, communicating with the stone fabricator to procure the balls and sockets and packaging them with the necessary pump, filter and water-treatment equipment mounted in turnkey equipment vaults. Because of the precise tolerances of the balls and their sockets, water quality is of absolute importance: Even something as small as a grain of sand can disrupt the hydroplaning effect, as can any build-up of algae. These systems typically contain less than 100 gallons of water, so while the systems may be small, they must be radically efficient. For all their versatility as visual design elements, the floating balls are mostly about the effect they have on people. Young or old, they don’t seem able to resist interacting with something so massive that nonetheless floats on a thin skin of water. It’s a magical effect – one that is, without doubt, here to stay. The balls themselves are extremely heavy. Spheres with two-foot diameters (the smallest we provide) weigh in at 670 pounds, while eight-foot balls weigh a whopping 45,200 pounds. In all cases, they are delivered to their sockets in custom-made slings. Despite the fact that these are relatively expensive fountains that can cost anywhere from $2,000 to well beyond $60,000, a growing number of clients have been willing to make the investment because they see these fountains as cost-efficient. The fact that they’re made of stone and have a distinctly simple design certainly helps. The fountains will basically last forever, and in all the years we’ve been designing and installing them, we’ve yet to have one fail in any way. As described in the accompanying text, floating-granite-ball fountains can be used to great effect in a wide range of settings. They are beautiful in their simplicity and quite dynamic as interactive watershapes, often serving as focal points and gathering spots in public places or commercial facilities. It was one of the first projects of this nature we’d done, and it was incredibly exciting (and moving) to watch these children light up with delight, amazement and a sense of empowerment as they interacted with the ball. We heard stories of improperly machined balls, inadequate sub-grade support, balls broken in transit and other tales of woe, but we’ve found that by working with a reliable stone vendor and obtaining balls and sockets that have been properly machined and balanced, those sorts of issues have never arisen for us and as a result we take great pleasure with every additional floating-ball fountain we design and install. Certainly, these fountains occupy a narrow niche, but we’ve always been impressed by the universality of their appeal: There’s a near-addictive quality to playing with them and they invariably attract a great deal of attention. It’s tough to say whether they will continue to grow in popularity or fall out of favor someday. For now, however, it’s clear that floating-granite-ball fountains have taken their place among the panoply of watershapes and will continue to delight and amaze generations of people of all ages.